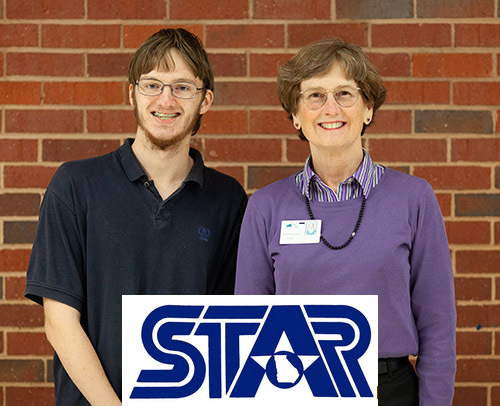 2019 PAGE STAR Student, Dale Smith selected Dr. Kathy Daymude, Math teacher at PHS, as his STAR Teacher. STAR begins each year in participating Georgia high schools when the STAR Student is named and chooses a STAR Teacher to share in this recognition. The students and their teachers are honored by their schools and receive special recognition in their communities from one of the more than 165 statewide civic organizations and businesses that serve as local sponsors of the STAR program. Students then compete for school system recognition as the top STAR Student, and those winners compete for region honors. Region winners contend for the honor of being named State PAGE STAR Student. STAR Teachers continue on with their STAR Students at every level of the program. Dale says “I chose Dr. Daymude as my STAR Teacher because I feel that she was the teacher that most encouraged me to take on extra work outside of the classroom to broaden my horizons”. The Optimist Club will recognize Smith and Daymude at the annual STAR Banquet on Tuesday evening, March 12th. The banquet will be held at Chattahoochee College at 7:00 pm. If you would like to attend the banquet, reservations can be made by emailing the Optimist Club at pickensstar@etcmail.com. Reservations are required, and the cost is $25.00 per person.